Having recently celebrated the July 4th holiday and vacationing in Maine and New York, I feel energized and ready to take on new challenges. Even though I am not sure what to expect or where the unknown will take me, I am excited at the thought of new possibilities. Many thoughts come to mind. Do I promote the antics of Rosie the Clown, do I continue my ukulele class, do I try and improve my golf game, while finding time to grow The RoArt Group? Can I make time for everything? My thoughts stop mid-way and I hear the little voice in my head telling me to focus! Focus, the little voice said louder! I looked around the room to see if anyone was watching me and I began to talk to the little voice in my head. I asked aloud, “Focus on what?” The little voice responded and said, “Focus on what you like to do, focus on your passions…… the voice in my brain pounded in my head and shrieked wanting to be sure I heard the message. “We all spend too much time doing things we don’t like, things that pull us in many directions, and not spend enough time taking care of our own needs.” It was my AHA moment! WHAT ARE WE WAITING FOR? Why are we not paying attention to what we really like to do, what we really want? Time flies by and if we don’t step up to the plate we will miss out on life, our life. I love clowning, I love entrepreneurship, And though I am always challenged by learning new things. I realize I must focus on my true passions and plan the steps that will guide me to achieve my success. So as I move forward after the 4th of July holiday, I will follow my heart. I love the crazy antics Rosie the Clown performs. I love making people smile, I love making people happy. 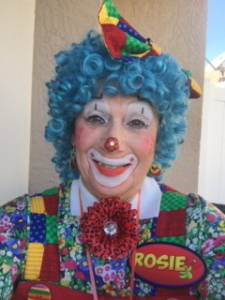 To fulfill my passion, I created a Facebook page for Clowning Around With Rosie, and shortly will create a website, My goal is for Rosie to entertain and to do birthday parties for kids and adults and any other celebratory special events. Search Facebook: www.facebook.com/Clown-Around-With-Rosie-898016163673297/ for more info. I also love my consulting business, The Roart Group. I love working with my partner, Arty. We are a great team in business and in life. For more info and how we help businesses succeed check our website, www.theroartgroup.com or check our Facebook page, The Roart Group, Your Link To Financial Success.